Manchester United host Burnley in a Premier League meeting on Tuesday night, so we caught up with sports writer and radio broadcaster Jonny Bentley (@SportsJonny), who is a life-long Clarets fan, working at Lancaster University’s Bailrigg FM. The Clarets face a relegation battle this season and were hammered 5-0 against Manchester City in the FA Cup over the weekend. Bentley opens up on Sean Dyche, how Robbie Brady is getting on at Turf Moor, and his admiration for Ole Gunnar Solskjaer. Hi Jonny, thanks for answering the following questions for SN. It’s been a difficult season for Burnley, so what factors are you putting this down to? It’s difficult to put it down to one single thing. It feels like a cumulation of smaller errors. The summer transfer window was very poor with not one signing that would improve the first eleven. Joe Hart performed fairly well but, as has been seen in recent weeks, he never gave his defence the assurances of Tom Heaton or Nick Pope. Ben Gibson is a very capable defender but has been unable to oust either James Tarkowski or Ben Mee. Both players were sideways transfers that didn’t take the club forward. As I say, it was more of a collective drop from too many first team players. Other than Johann-Berg Gudmundsson and Joe Hart, very few people that started regularly covered themselves in glory over the first half of the season. It’s ironic as well that Hart, a player who had been one of the team’s brightest players, was also a major reason for the club’s decline. There were some reports that speculated on discontent within the ranks and this seemed evident. Detailed in this report were grumbles over Dyche’s own personal wage, his poor handling of Heaton and his initial reluctance to start Ashley Barnes. The performances lacked the grit and determination that one would associate with a Dyche team. Thankfully, performances have improved and that steeliness seems to have returned. A return to the team for Phil Bardsley seemed to reinvigorate the team and Dwight McNeil’s meteoric rise from the academy has breathed new life into Burnley’s attacking play. Heaton’s recent return to the line-up has coincided with the Clarets’ impressive league form with the club captain instilling a calmness to a shaky defence. One excuse that I don’t buy is the Europa League. First of all, Burnley never made it to the group stages of the competition and, therefore, it would have only effected the first month of matches. Had Burnley made it into the actual competition, then the excuse would have been more than valid. People would be looking at the board and asking even more questions about a poor summer of transfer business as a tight squad snapped. Tactically, Sean Dyche likes a good old-fashioned 4-4-2 system. Do you feel this gets the best out of your players or would you consider switching management now and encourage a more forward-thinking approach? At the moment, the 4-4-2 system is doing the business. It is the system that Dyche has built his successes on and so it makes sense to stick with it. Tactically, it’s basic but Dyche is at his best when he keeps his tactics simple. He wants rigidity, he wants hard work and he wants to get the ball up the field quickly. Although, there have been some small tactical tweaks of late. This season, against the bigger teams, Dyche has reverted to a back-five system with a view to becoming even more compact. The plan was minutes away from securing a hard fought point against Tottenham and it kept the Clarets competitive in a 3-1 defeat at Arsenal. However, it spectacularly backfired on Boxing Day when an out-of-form Everton blitzed the Clarets 5-1 and, just this weekend, City also hit five against the Burnley back-five! Dyche is a manager in the mould of a Tony Pulis or a Sam Allardyce. That’s not a criticism of him or his work at the club; the way he has elevated Burnley has been unbelievable. His mantra is hard work, hard work and (err) more hard work! That is the epitome of Dyche and Burnley Football Club. Many other managers may tinker formations and positions to get the best out of particular individuals but Dyche favours collectivity over individuality. He will choose a tireless workhorse over a mercurial talent who doesn’t have that same level of work ethic. Would I change the formation to be more progressive? No, probably not. Dyche is most effective when he keeps things simple. Perhaps there will be a time when Burnley may want to play more progressively and then you’d have to see whether or not Dyche could evolve. I have my doubts. Returning recently from a three-game ban, we know all about Robbie Brady from the youth academy at United. I’ve also had the pleasure of interviewing him on the international stage. How is he, Tom Heaton and the other former United lads viewed at Turf Moor? Robbie Brady has been a mixed-bag since his £13 million move from Norwich. At times, he is majestic. A 30 yard free-kick against Chelsea and an exquisite assist for Chris Wood’s equaliser against Spurs, last season, are two of his stand-out moments. Unfortunately, those pieces of magic have been a little more sparse than many would have liked. £13 million is a hefty transfer fee for a club of Burnley’s size and he is yet to fully repay that money. Heaton has been a revelation. Leads by example on and off the pitch and has arguably been the best signing of the Dyche era, given that he was a free transfer from Bristol City. It appeared that he may have been on the verge of leaving after losing his spot to Joe Hart but the club captain has been restored to the team and is performing really well. Staying in the Premier League must be priority, even if FA Cup elimination is a bitter pill to swallow. How do you fancy your chances with Burnley currently 16th and just three points off the drop zone? I am quietly confident. There is still a long way to go in this proverbial marathon but the big positive is that the team are in a good patch of league form. Three wins on the spin and a point away at Watford has been the perfect tonic to the Boxing Day horror show against Everton. Now it looks like there has been a return to the Burnley that we remember; players are being dogged and throwing their bodies on the line and this elevation in attitude is picking up results. It looks like a battle with Cardiff for that 18th position and, no doubt, there will be another team that falls by the wayside as we approach the final hurdles. For me, Huddersfield are down. They have some decent players but, aside from Aaron Mooy, they badly lack creativity and their strikeforce is toothless. Fulham look like they’re joining them because, for all the big players that they have, there is a real lack of cohesion. Burnley could well fall into that third relegation spot but Cardiff are looking ropey. Both Cardiff and Burnley share a lot of similarities in preferring substance over style but the Bluebirds’ lack of firepower could prove to be costly. Greatest and worst moment following the Clarets? I have been a regular follower since 2007 so you could say I’ve been lucky with what I’ve seen! Many supporters who are older than me will recount the days where the club struggled to stay in the football league! My greatest moment is the 1-0 win over Manchester United in the 2009-10 season. It was Burnley’s first ever home match in the Premier League so to beat Sir Alex Ferguson’s Champions was an absolutely incredible feat. What a winner it was, as well, from the talismanic Robbie Blake! As I say, my worst moment won’t compare with that of older Burnley supporters others but it was probably when Owen Coyle decided to leave the club. At the time, Coyle was adored by the Burnley faithful for getting the Clarets promoted and playing an attractive brand of football. His decision to take the Bolton Wanderers job always left a sour taste in the mouth because it felt like a betrayal; he left in the middle of the season when the club needed him the most. He was replaced by Brian Laws, a move that began the downward spiral that saw Burnley relegated back to the Championship. What do you like/dislike about Manchester United? I love United at the moment because of the manager. Ole Gunnar Solskjaer is a breath of fresh air. He takes press conferences with a smile etched on his face and he exhumes positivity in everything that he does. It is a complete contrast from Mourinho who was sucking all the enjoyment out of the club. I don’t particularly dislike United but I am not of the opinion that they are entitled success; you have to earn your success. Ferguson worked incredibly hard, season after season, to ensure the club remained successful. He was at the forefront of that success. Anyone who still feels United are entitled to be winning trophies is wrong. No club is entitled to win anything. For the record, I would like to see them win something under Solskjaer and I would love to see him given the job long-term. Thoughts on José Mourinho and facing a more explosive side managed by Ole Gunnar Solskjaer on Tuesday night? In fairness to Mourinho, the board let him down this season. They extended his contract last season and then they failed to back him in the summer transfer window. That is brainless from Ed Woodward and it is symptomatic of United’s stupid decision-making post-Ferguson. The Portuguese is a manager who spends big and gets short-term success; he buys proven players and finds a formula that works. United’s squad is packed full of talent but it needs coaching and developing. Mourinho isn’t the man who is going to do that. So, all things considered, the decision to appoint him in the first place was something that went against the club’s values of developing youth. Invariably, he had to be sacked. The turnaround under Solskjaer now is remarkable. For me, I see no reason why Solskjaer shouldn’t get the job on a permanent basis. United have appointed ‘elite’ managers and it hasn’t worked. They have arrived with their own ideas and their own backroom staff and it has taken away from what it meant to play for Manchester United. Solskjaer is a product of the Sir Alex Ferguson days but he is also a good coach. Alongside Mike Phelan and Michael Carrick, it seems Ed Woodward have stumbled across something that is looking really promising. The players clearly love him and the feelgood factor has returned. I think the return to a back-five, at the Etihad, may be a suggestion that this is how Dyche intends to set up against the bigger teams. For 50 minutes, the patched up team was doing a relatively decent job of containing Guardiola’s men. After Bernardo Silva made it two, though, the wheels began to quickly fall off. Heaton; Bardsley, Tarkowski, Gibson, Mee, Taylor; Hendrick, Cork, Westwood, McNeil; Barnes. I don’t think it will finish 5-0! For starters, Dyche will go for his preferred eleven and that should be enough to avoid another pounding in Manchester! 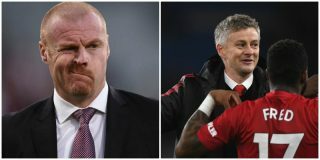 In the likes of Aiden McNeil and Ashley Barnes, Burnley have players who can cause United problems and they do have a habit of leaking the odd goal. However, with the plethora of attacking gems that they have at their disposal, it’s tough to look beyond a comfortable win for the Red Devils.